When it comes to make-up it is so easy to see mistakes when other ladies are making them, but not so easy to see them on ourselves. Here are some tips that I hope help you improve your make-up techniques. ** You should not apply color to your eyes, cheeks and lips without first evening out your skin with foundation. There are very few ladies who have flawless skin and it is therefore important to prepare your skin, so your make-up looks more groomed and ‘polished’. ** Concealer is actually applied after your foundation to cover any areas that are still visible – like blemishes, age spots or pigmentation. You can also use concealer on the dark circles under your eyes that make you look tired. If your eyes are not fresh looking over the eye lid area and through your eye crease, you can use concealer there as well – this will make you look years younger. Creamy textured concealer works well over your eye surface. ** Applying a high quality loose powder over your foundation and concealer sets these products in place and reduces excess shine on your skin. Over shiny skin looks older because light is attracted to shine and when the light shines onto your fine lines and wrinkles it illuminates them. Younger skin can handle more shine on the face - if the skin is in good condition. If not, matte skin will be more flattering and detract from your blemishes. Don’t be put off by powder, gone are the days of pasty, thick powders – today we have the choice of jet milled feather light loose powder that you can’t feel on your skin. ** Never wear one shade of eye shadow all the way from your eyelid area to your eyebrows. Eye shadow is used to create illusion and if used correctly can enhance your eye area. Make-up artists use light and dark shades on the eyes to create illusion. Light shades like off white or cream, work well in areas on your eyes you want to ‘pull’ forward and enhance. Darker shades like stone, beige, brown, grey or black create the illusion of adding shape in areas you want to ‘push’ back. it provides a great frame for your eyes and looks more groomed. ** Applying blusher to your cheeks adds shape and color to your face. Use neutral shades of beige or soft peachy or pinkie shades. The darker your skin the darker you can apply the color. ** Adding lip products: If you want to add more color to your face now is the time to do it. If you have small lips go brighter or lighter rather than darker. If you are going to wear a darker lipstick shade apply it with a brush to ensure a clean edge of lip color. Lip liner is used to define the mouth but should not be obvious. Lip gloss adds the final touch, it not only provides your lips with moisture but helps to make your lips look fuller. 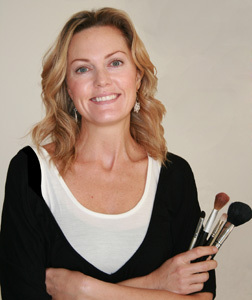 Debbie offers more individualized on-line make-up advice.